There comes a time in every person's life when he or she must decide what to do with the time they've been given on earth. Will it be used to benefit mankind, or to destroy it? Will it be to help or to harm? In Google engineer Paul Carff's case, he went for both. Thus, KegDroid was born. 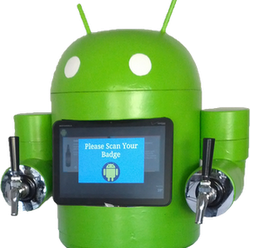 This gorgeous Android statue, with beer taps for hands, dispenses home brew at the touch of a screen. The keg comes complete with flow control, so you can select what size drink you want and the bot will pour it automatically. It uses NFC tags to ensure that only approved users can get at your precious booze supply. Of course, when we say "you" we don't really mean you. Sadly, Paul hasn't released any instructions or specs on how to recreate KegDroid, but who knows? Maybe Google will see fit to promote this as a 20% project and get into the micro-brewery business. Who's up for some Google Beer?